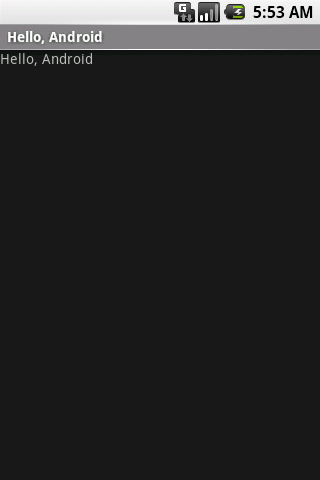 A while ago, I built a widget in Frog’s FDP which sets the content of a page based on the time of day. This is really handy for us, as it allows access to Flash games and social networking outside of lessons, but switches them off during lessons. I’ve spent some time trying to work out the best way to turn this into a widget for Frog, but the complexity needed to make it general and the instructions that would have to accompany it made it all seem like it would never really work. So instead, ahead of Frog’s annual interNational Platform’s Conference, I thought I’d post this tutorial here. I’ll be speaking at the conference, as well and I’m fairly certain there’ll be workshop videos posted shortly afterwards. I’m quite pleased with the widget. If only because it originally began life in PHP and I had to learn the FDP code in order to remake it. …. Our code goes here ….. So, I can get the name of current day by putting that number into the array dayNames I created. I could do all this with just numbers and miss out this step but I find it’s easier later on. The reason I’m getting the days of the week is that our school runs a two-week timetable and on Wednesday finishes at 2pm for staff development. Also, it allows the fun stuff to be accessible on weekends at any time. This IF statement simply changes the variables if the variable day is set to Wed. The final variable needed is one I’ve named naughty. This should give you an insight into my sense of humour. If naughty is set to 0, you can use embed Flash files, or iframes or whatever you wish simply using document.write to fill in the code. Looking through this code, you’ll probably see why it would be so hard to wrap it up as a generic timing widget, given the different number of periods each school uses. Hopefully, you can see how you’d be able to adapt this to suit your needs. In this ever increasing series, we now come to the fun part. All the hard work is done. You’ve coded in Adobe AIR, tested on your computer…now we wrap it up all pretty. A particularly nice feature of Flash Professional’s AIR package is the publishing settings. You specify a name for your app, whether you want to fix it as landscape, portrait or allow the phone to flip it depending between the two. 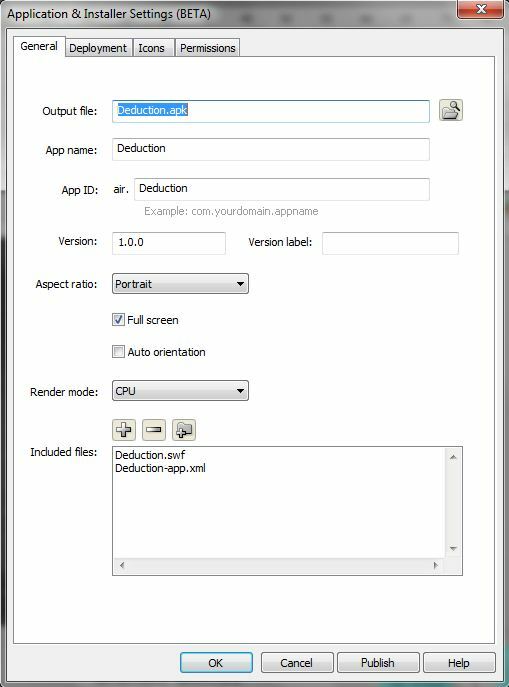 (There’s an example template included which gives you the code to access the accelerometer, so you can have your app flip correctly). Making an app requires a certficate containing your details. This certificate is password protected and bundled with the app. I’m not 100% sure what the point of this certificate is, but the wizard makes it very easy to create. Just don’t forget your password, which you need to publish the app! 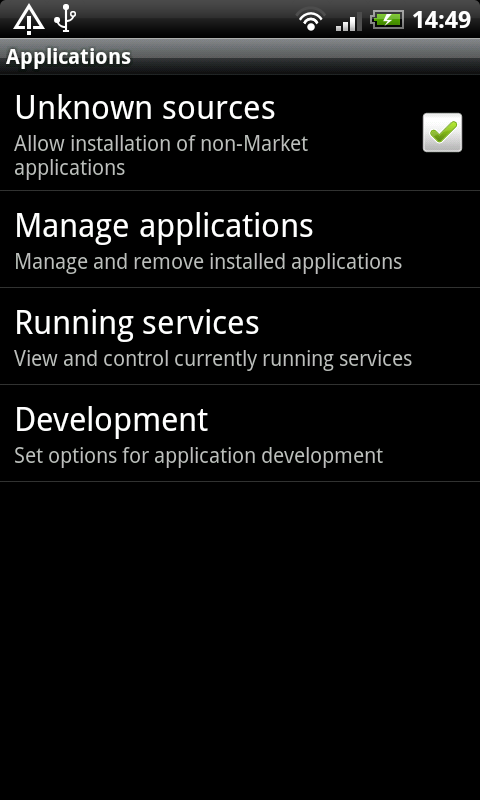 You also get to specify what you need your app to access in order to work. This allows users to decide if they want to install your app. If your app plays sounds, and want them to automatically silence if a cell is recieved, you can check a permission to read phone state. Use with caution! If you’re the maker of a widely successful vegetation vs undead game and you have this particular permission setting you block all non-phone tablet users from playing. This bit should probably be a bit higher as let’s face it, if you’re making an app you’ll probably have been testing it all along. Just in case you didn’t know, plug your phone (or Samsung Galaxy Tab) into a handy USB socket (preferably one attached to the computer you’re using). Then go to Settings > Applications > Development and check USB Debugging. And suddenly, your phone becomes the ultimate in user testing environments. In theory, if Adobe AIR will run on a phone, anything you get working on your phone will work in exactly the same way on any phone. The final step before unleashing your app upon the world is editing the manifest. When you press publish in Flash, the program takes your flash file and wraps it up with the png icons you made, that certificate we talked about and an XML file generated in the publishing settings. This XML file contains publishing data such as the permissions, the file name etc… It also contains the manifest. If you want your users to be able to move your app onto their SD Card thereby saving room on their phone’s internal memory, you need to edit this bit before you press publish – after you have finished editing the publishing settings otherwise Flash will overwrite your changes. Which gives users the ability to move your app. Sorry, it’s taken a while to get here. Basically, just hit “Publish”. 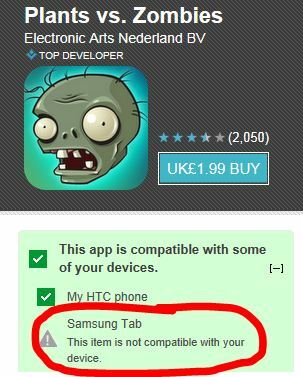 Your app gets wrapped up as a .APK file. All ready for deployment. The beauty of Android is that if you’re making a very specific app that the wider world doesn’t need to know about, you can distribute this APK file like any other file. Uploading it to your VLE or website allows users to download and install directly. They do need to ensure to have Unknown Sources checked, but that’s about it. At the time of writing, I’ve only uploaded our Question Dice, but plan to upload more when the time allows. Making the video demonstrating its use was fun, but a word of warning, make sure to replace the audio before uploading to YouTube. I had to hurriedly delete and republish. 30% of the users are on Gingerbread, one on Honeycomb and the rest on Froyo. The devices range from the Galaxy Tabs to phones of every description to a host of other tablets. Outside of the UK, we have three users in the USA and one in Australia. We had a user in Spain, but they’ve uninstalled it 😦 I wonder why? Making apps can be as simple or as complicated as you like. Adobe Flash Professional allows you to make apps in Adobe AIR. Ignore all the “professional” AS3 coders who pretend AS3 is highly complex. 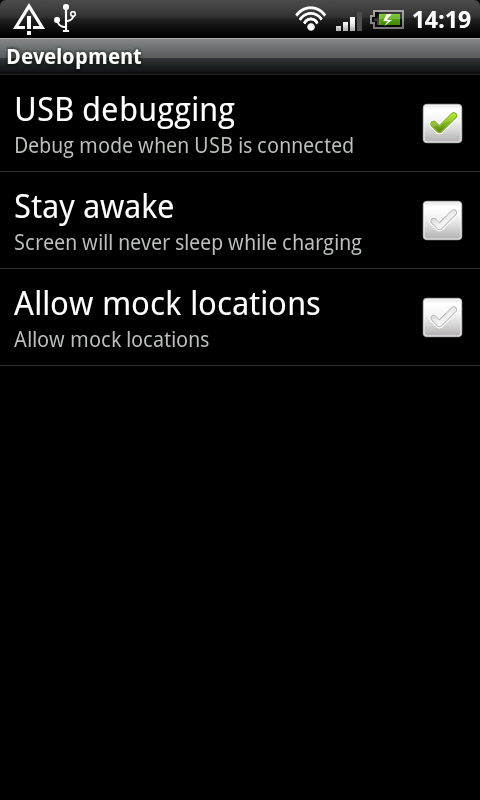 Think about permissions and remember the install location setting for the manifest. Dont swear while filming your demo video. As with everything I write about on this blog, things are often easier than they appear to be. The hard part is finding good tutorials and websites and people willing to help. If nothing else, I’ve hopefully provided a summary of all the bits you need to get started. Flash. Aha! Saviour of the internet! I love Flash, although I seem to be in an ever reducing minority, which no longer includes Adobe for some reason. I think I know why – Flash in webpages on mobile devices isn’t as responsive as it feels like it could be. There are resizing issues and supposedly it causes crashes, although I’ve never experienced a browser crash because of Flash. Apple have blamed Flash for being too RAM intensive to be safely included on their iPhones and iPod Touches. This decision had the happy coincidence of closing off thousands of free Flash games just as Apple were launching their App Store full of paid games. As a development platform, Flash is second to none. I said previously that only Apple understands about wrapping up everything you need. Well I have to include Adobe as well in that exclusive club. Flash combines graphics, animations and coding very easily and with the downloadable Adobe AIR for Android plugin folds in app making too. 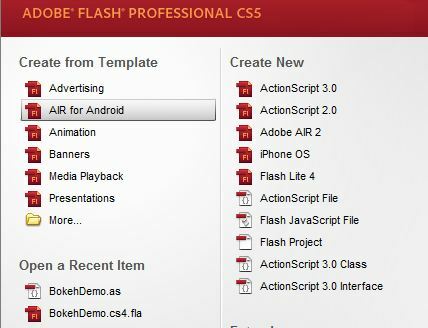 Flash CS5 also comes with the ability to make Apple iOS apps. Unfortunately, due to restrictions imposed by Apple, (you need a certificate which can only be create on a Mac, you can only upload to the App Store from a Mac) . Using Adobe AIR to make apps is simplicity itself. You open a new file, using the AIR for Android template. From here, you build your Flash file as usual. 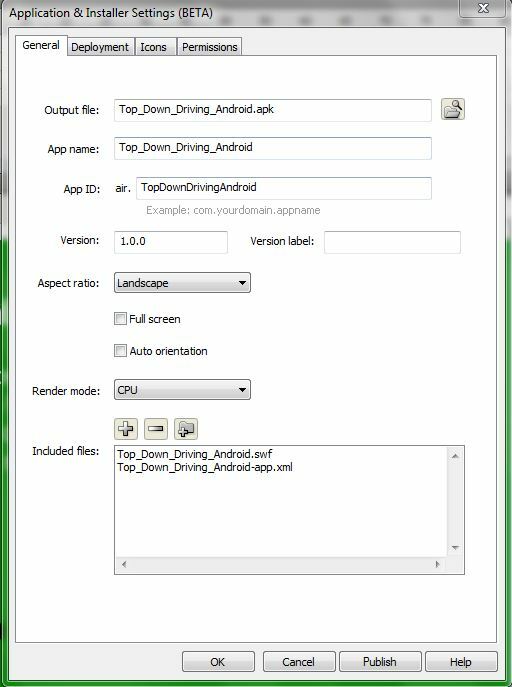 At this point, I need to point out that out of the box, you don’t get AIR for Android as a template (at least not in CS5). I seem to remember being alerted to its existence by a popup on this screen. I do remember adding it via Adobe’s Extension Manager and unfortunately, the Developer Site doesn’t make it clear how to get it either. Maybe it’s just bundled in. Note from this screen you can also make iPhone OS apps and standard AIR programs to run in Windows. All three are pretty identical and just differ in their publishing settings. When you open the AIR for Android template the stage is automatically set to 480 x 800 which is the most common screen resolution for the Android platform. Of course, you can alter this easily. There are four templates included with Flash, one is plain, but the other three contain code examples showing how to use a mobile device’s accelerometer, its menu button and a swipe gallery. Between this, my own knowledge of ActionScript 2.0 and the internet, I was able to build a number of apps, such as the Question Dice. The programming language for Adobe AIR is ActionScript 3. This is really unfortunate for me, because I learned the previous language ActionScript 2. AS2 is a much simpler language to learn, its grammar is less precise and how it functions is fairly straightforward. AS3 is much more complex, designed with professional teams in mind, not individual programmers. To this end, it is incredibly intimidating and the general advice on internet forums tends to be irrationally anti-AS2 style. I’ve seen a number of posts from novice users, asking perfectly reasonable questions only to be shouted down with cries of “you shouldn’t be doing it like that at all”. Years ago, I was similarly shot down for asking a question about linking one scene to another. The response was “you should be using scenes”. Now, I have the confidence to question that. If you’re not supposed to use scenes, why does Flash include them? Personally, I very rarely use scenes now, but if I needed to I still would. The moral of this story is ignore all negative comments on the internet. The trolls are never right. Well, I’m finally learning AS3 and firstly, everything you’ve read about team programming and OOP and the “right way” to do things is rubbish! AS3 is almost as forgiving as AS2. Public functions, private variables and separate .as files are only needed IF you are writing complex games AND you use a separate .as file. It came as a bit of shock to me. The so-called right way is simply one way. You can happily code in AS3 on the timeline. If you do use code from a tutorial and run into compiler warnings about public functions, just remove the public bit. if you’re placing code on the timeline. Oh and regular functions, not connected to mouse clicks can just be written as AS2 functions. Rely on the Code Snippets box too, it really useful to get started. The book I’m using is an update of the book I learnt AS2 from. 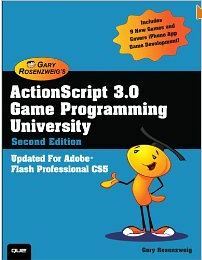 It’s called Actionscript 3.0 Game Programming University. The author, Gary Rosenzweig has an excellent, easy-going style. He provides the full code for each game, but breaks it down ito what each section does. Something I liked from his original book is that each game only takes you so far, but it’s always easy to see how to develop each game to make them better. My wife was right. This post has become its own mini-series. A few months ago I posted about the new App Inventor from Google which has a pretty impressive App maker for Android phones. Unfortunately, I found it all a little awkward to use. Animations for example seemed impossible. Google own Android SDK also proved a steep learning curve. And you need a Mac to use Apple’s iOS SDK. So all in all, building useful Smart Phone Apps (or even rubbish ones) seemed out of my grasp. Then several things happened. Firstly, Apple announced a relaxation of the policy towards third-party App making software, then Adobe released Air for Android. 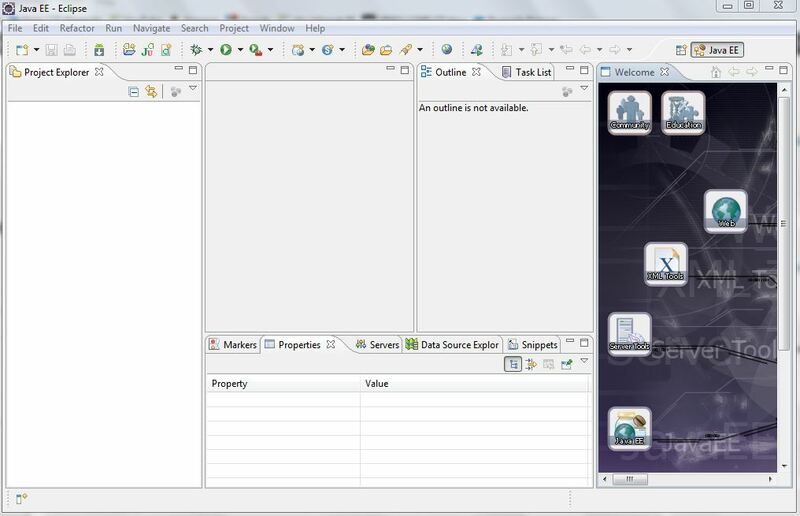 Suddenly it was possible to build Apps in Flash Professional and export them for phones and tablets! This weekend, in a couple of hours, I took a favourite game my wife and I built for a ventriliquist friend of ours (back in 2005) and converted it to ActionScript 3 (AS2 is a lot easier, but is being replaced by the more complex AS3 – though AS2 will still work for traditional flash resources on websites). Once it was running in AS3, using the new AIR for Android template I was able to plug my phone into the PC, set it to development mode and build a new App. For some reason, Adobe have almost hidden their Android template. After much searching, I found it on their Adobe Labs site. But it was apparently available or linked from their Adobe AIR site. Strange? For those of you who don’t know the dice game Pig, you take turns rolling a dice and adding up the amount on the face. If you throw a ‘1’, you lose your points and play reverts to the other person. You can end your turn voluntarily at any point. The winner is the first to 100 points. You can play the original version here. 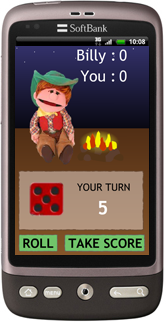 One cute thing we added for the app is that you can shake the phone to roll the dice. There are certificates to be correctly filled out, and testing to be handled before I submit this game to the App Market. And in theory, I should also be able to press a button an convert it into an iPhone App too. I’ll post here once I know more and as I understand, for Android at least, you don’t have to submit it. You can just host an app install file on your own server. This is going to be huge frankly! As school budgets tighten, and ICT use expands, imagine the savings possible if we can build our own tailored apps. The new Advent Amico is a 7″ Android tablet which costs £129. That’s cheaper than most netbooks. We found netbooks main disadvantage was that they look like laptops, so people assume they can handle the same software as laptops. Smart phone tablets are taken to be big smart phones, and people only expect web browsing and basic use. The future is looking very bright, and if not orange, then decidely mobile!